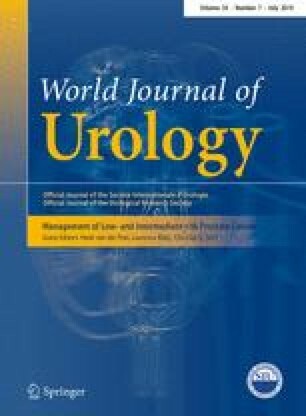 To investigate feasibility, safety, and efficacy of salvage radical prostatectomy (RP) for recurrent prostate cancer (PCa) after focal treatment with TOOKAD® Soluble vascular-targeted photodynamic therapy (VTP). Nineteen patients underwent RP after biopsy-proven PCa post-focal VTP. We reported: operation time, blood loss, transfusion, complications, urethral catheterization time, functional outcomes, and short-term oncologic outcomes. Median age was 64 years (58–70). Median PSA before VTP was 6.30 ng/ml (3.20–9.80). Median delay between VTP and RP was 17 months (8–48). Median blood loss was 400 ml (100–1,000). Median operation time was 150 min (90–210), median urethral catheterization time was 7 days (5–18), and median hospital stay was 7 days (4–21). There was no perioperative mortality. Three patients had related per-operative complications: one pelvic hematoma (150 cc) (Clavien IIIa), one per-operative transfusion (900 cc hemorrhage) (Clavien II), and one superficial wound infection (Clavien I). After a median follow-up of 10 months (1–46), 13 were completely continent (68 %), five needed ≤1 pad/day, and one needed 3 pads/day (Clavien I). Severe erectile dysfunction was observed before and after RP (respectively 8 and 18). Ten patients regained potency with appropriate treatment. Median postoperative PSA was 0.02 ng/ml (<0.01–0.38) and remained undetectable for 16 patients (84 %). Nine patients had positive margins and six underwent complementary radiotherapy. Positive margins were significantly associated with bilateral VTP [risk ratio = 4.3, 95 % confidence interval (1.6–11.7), p = 0.003]. Salvage RP after VTP treatment was feasible, safe, and efficient to treat most of the locally recurrent PCa. Short-term oncologic and functional outcomes were promising, but further studies are required. Trial registration: PCM201 (ClinicalTrials.gov identifier: NCT00707356), PCM203 (ClinicalTrials.gov identifier: NCT00975429), and PCM301 (ClinicalTrials.gov identifier: NCT01310894). We thank Pr Guy, Pr Bouchot, Dr. Barré, Dr. Navara, and Dr. Mandron for their collaboration. Pr Azzouzi is investigator and proctor for Steba Biotech. Pr Villers is lecturer for Steba Biotech. All other authors have no conflict of interest related to this study. Ethical and regulatory approvals were sought and obtained from the relevant national and local authorities.